Can you tell us a little bit about yourself? 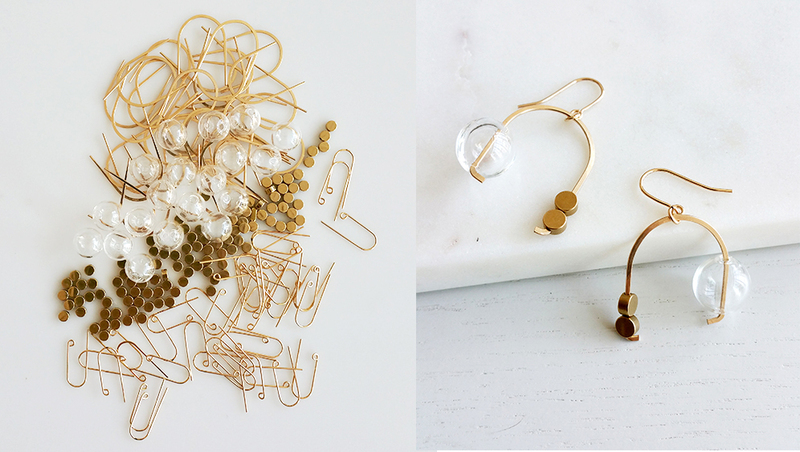 How did you get started with jewelry making, and how did Hyworks come to life? I am a designer and a maker living in Los Angeles. Before making jewelry I was a full time graphic designer for a company. At that time, I was desperate to create something of my own but didn't know how. One day as a distraction I took a jewelry making workshop and realized how good it felt to make something with my hands again. After producing in a 2D environment for so long, it was really refreshing to work with objects that I could touch and manipulate into wearable pieces. After making my very first collection, I decided to show it at Unique Market in LA, and that started it all. It is interesting to see how much my jewelry designs have evolved since that first collection. Have you always been a creative person? As a kid, were you drawn towards a creative life? For as long as I can remember I have loved making things. As a kid I just knew what made me happy, and that involved making something. I often made paper dolls and outfits for them and entertained myself for hours. An introvert, I spent time alone -- making art and reading books kept me company. After graduating college with a liberal arts degree, I went back to study fine art full time and realized how vital creating is in my life. That time was magical, one of most important periods in my life, because creating helped me find myself. Through making I learned to trust myself. It was such a liberating feeling to finally know, I mean, really know that I am capable. How would you describe your jewelry? What's something our readers should know about your jewelry? I love clean lines and colors. I would say my aesthetic is minimal and modern with a playful flair. I make my own jewelry in my LA home studio. I take much care making each piece, using quality materials. My background is in graphic design and fine arts. Graphic design taught me layout and composition, and fine art taught me to work with different mediums to create a form. I love working with a wide range of materials, and that’s a big part of my jewelry making. I am currently working with metal, acrylic, clay, hand blown glass, wood, felt and leather, and I have a feeling that list will only grow. Where do you seek inspirations for your collections? It’s hard to know when inspiration happens. I just know when it does, when I get goose bumps on my arms. I am influenced by the materials I work with, their textures, colors, and the way they look, these things alone contribute to inspiration. During the process of making, one design influences another and the next one is born, and so on until the whole collection is designed. I like to think that each collection has its own unique identity and soul. Who are some of your favorite jewelry makers, and why do you love them? 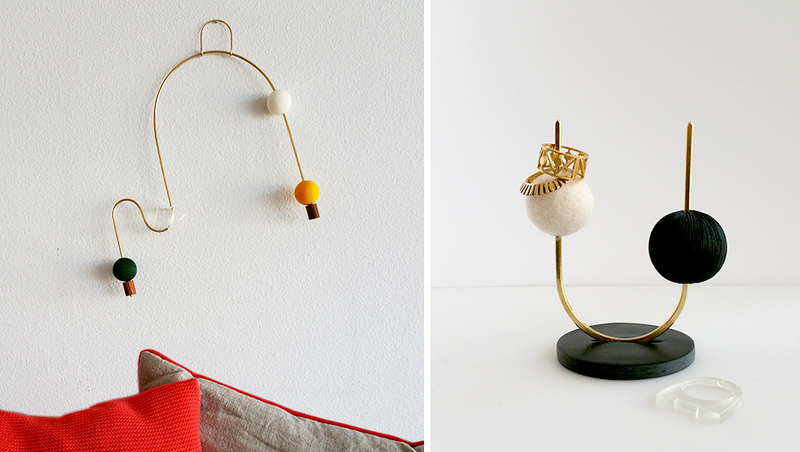 Recently I came across jewelry designer Hannah Keefe and was blown away by her work. I am amazed by her technique. She painstakingly solders each brass chain side by side to create a sheet to cut into various shapes. Her jewelry is little pieces of art. How do you stay motivated and passionate about your work? I wish I know the answer to that! When I have a hard time motivating myself, I often push myself to focus on just one thing, and after a while I find myself occupied with that project, getting my groove back. If that doesn't work, I focus my attention on something that's not work related, like going for a walk or a hike. What's the most challenging thing about running your own business? Too many things. This is my first time owning a business, and it comes with a huge learning curve. Being a small business there’s a lot to juggle. My daily operations involve producing jewelry, filling orders, answering calls and emails, ordering supplies, etc. all mostly on my own -- it’s a constant challenge. I have a long list of things to do each day, and if I get through half of it, it's a good day. I must add, my husband does contribute when he can, and that has been a big help. What are you working on right now, and why are you excited about it? I have just completed a 2018 collection and am already thinking about a 2019 collection. A lot of ideas are floating in my head. In addition to my jewelry, I am interested in creating unique art pieces and expanding my home products. That's something I am looking forward to doing this year. Check Hyun out on Instagram and her website.